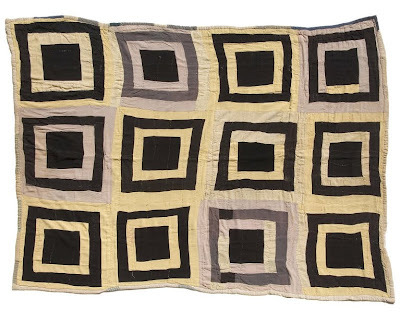 Hand-stitched black, yellow and gray African American quilt made of rayon. 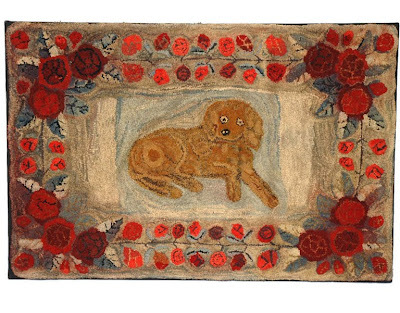 Hooked rug with a dog in the center surrounded by a red floral border. Made in New England, wool construction, probably Massachusetts. A great early example, nicely executed, with strong colors. Wool construction. Exceptional African American Pine Burr quilt. All hand quilted and pieced. Found in Selma, Alabama. Fantastic color placement and design. These quilts were made with leftover fabric and clothing. These quilts are very labor intensive and would take many years to finish. A simple frame is needed for this quilt to hang on the wall. We do not have it attached to a frame in the image. Framed it will hang appropriately on the wall. This quilt makes a very dynamic wall hanging. 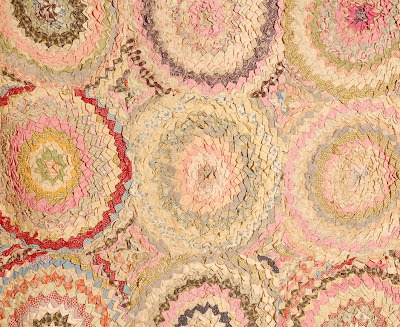 Attributed to Lucy Mooney Gees Bend, Alabama, Circa 1930-40. 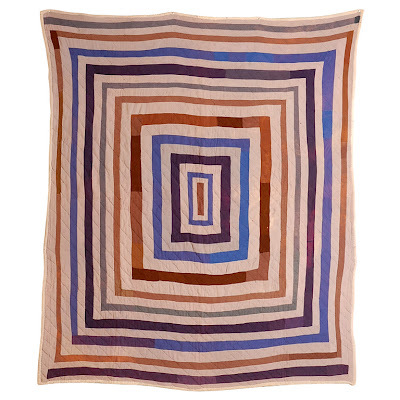 The backing is made from 100 pound welfare sacks issued by the US Government, and says: “The Department of Welfare...Donated by the people of the United State of America - Not to be sold or exchanged.” This quilt is an amazing abstract wall hanging. African American made double sided Memorial Quilt. Wonderful abstract wall hanging. Constructed from the work clothes of a loved one that had passed on. Also some strips of vintage ticking. 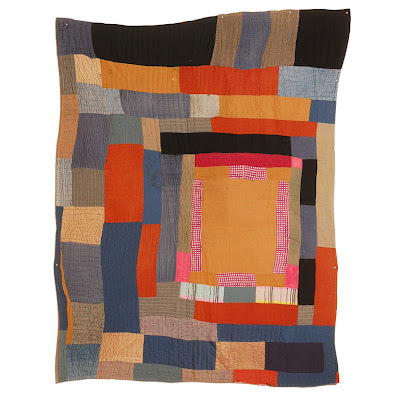 Made by Annie Rogers, Creedmoor, N.C.
Gees Bend, AL African American Quilt made by Clementine Kennedy (1904-1974). Concentric squares or housetop variation. 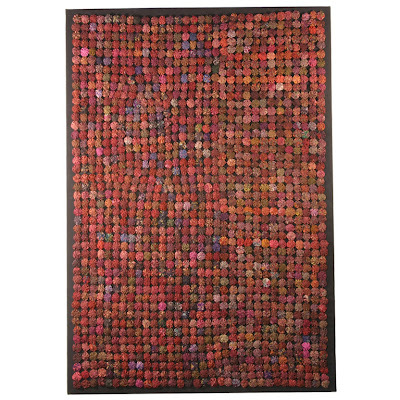 A painstakingly executed graphic textile in beautiful colors, this “yo-yo” mat reflects the light in subtle ways to create an astonishing wall hanging. IF YOU ARE CONSIDERING A NEW COLLECTING AREA, YOU MIGHT CONSIDER high-quality American textiles, such as quilts or hooked rugs. For example, African American quilts are often characterized by their freedom from the traditional rules of quilt making. 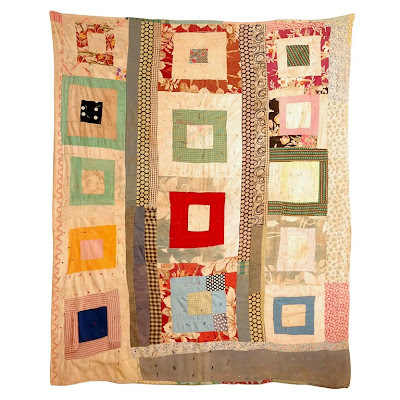 Often made from hand-me-downs and scraps of fabric, these quilts are often pieced as things fit—or by following a vaguely defined and always changeable design. Abstraction is the word that best defines them—beautifully balanced in a way that allows chance to play a role in the design. 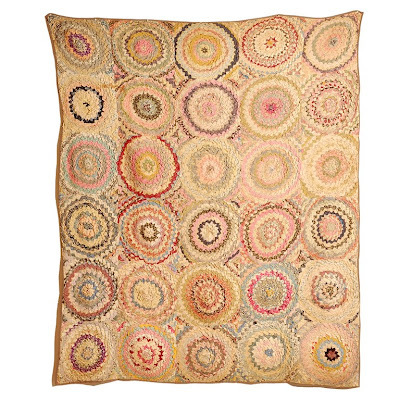 But if you like tradition—there are plenty of other quilts and hooked rugs to fill that need. Either area you wish to collect in, there are still opportunities to find nice examples for under $500. As for the rarest and most collectible examples in an category, the sky is the limit for cost. All examples via 1st Dibs. They also make some lovely quilts in Ghana from the scraps of the seamstresses. Maybe the tradition was passed down from the slave descendents who originated from this part of Africa. I'd love to see them. Then, there are the Japanese Boro pieces that I wrote about in an earlier post, quite similar. These are all remarkable and beautiful in their own way. 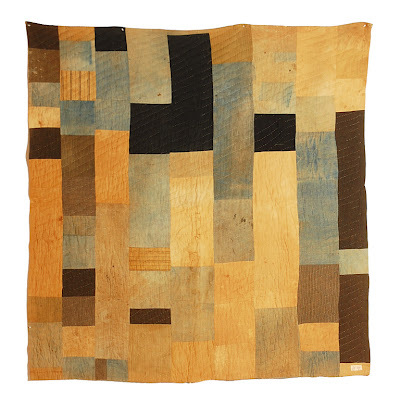 Beautifully simple and strongly graphic quilts in this post. I have one almost exactly like the first one in your post. Shades of beigy pink pancake makeup color and navy blue in a rayon sort of fabric. It's great on my wall.